Nothing Jessica wrote implied you were in any manner at fault. Her point was that school buses are better built to withstand such impact without harming the riders than your car is — was. This was all in relation to an earlier comment that since people don’t notice buses, cars are safer to be in. Your car was hit and you were injured in just such an instance. I hope your injuries heal quickly and completely. 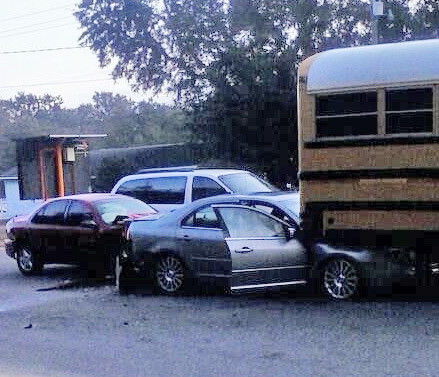 With school buses making so many stops in the roadway every day I think they should be outfitted with some type of guard extending downward from the rear bumper to keep cars from ending up under the bus….the folks in the silver mercury were VERY LUCKY glad there ok! Not sure why I am responding, I guess to educate Ms. Hemp. I was the driver of the silver car. If a pssenger is under a certain weight, the passenger air bag will NOT deploy… and it did NOT deploy. Sensors are in the bumpers, from what I was told and with my being bumper going UNDER the bus, none of the air bags deployed. 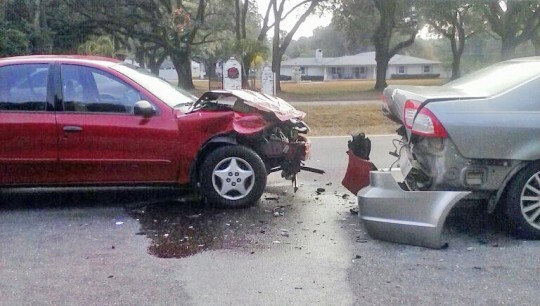 Perhaps everyone would have been safer had the driver of the red car …maybe stayed home…been paying attention. We could have died and I find it offensive to read your uninformed remarks…like my airbags being deployed! My car is TOTALED and I was injured. To suggest any fault being mine…I will stop at that! To all you car riders of your children, its not safe anywheres, but what if your child had been the passenger in the silver car, air bag came out, they wouldve been safer on the bus that morning. At Evans: if it was a mac biscuit, there’s your problem. He probaly got sick & wrecked. Accidents caused by distraction due to phones/ipods, etc. will get far worse when today’s kids will reach the age to start driving. My 4 grandchildren don’t hear, see or pay any attention to their surroundings – their complete concentration is directed toward the electronic devices in their hands. Scary – it’s no longer an obsession – it’s an addiction just like drugs or alcohol. I drive this route everyday for work. The morning drivers on Pine Forest Road are like drivers on all roads, they don’t want to be bothered by a school bus stopping for kids. This bus has been passed with red stop light flashing many time. Until this year this bus picked up all of Silver Lake Mobile Home Park right off of Pine Forest Rd., now I believe it drives into the park for the safety of the children. When I am stopped behind a bus I think to myself, this is a delay in my commute, but if that was my child, I would want all drivers to stop for them and that little thought keeps me focused on the safety of the children comes first. I do my best to stay at at the posted 45 MPH on Pine Forest Rd., it is hard when a long line of “annoyed drivers” are behind you demanding to go 60 – 80 MPH. I do not know if the driver was texting, talking on a phone, eating breakfast, got enough sleep last night, or daydreaming, but what I can tell you is all of us drivers need to just slow down and stop speeding and switching lanes all the time and being aggressive. Safety comes first. Actually, many don’t watch out for anything. That being the case, having the children in a school bus makes them less likely to be in a wreck and more likely to survive without injuries. Come on now. You know it’s how difficult is is to see a stopped school bus. you would have to remove all distractions then: kids, passengers, etc not just phones and radios. The issue is people need to pay attention and SLOW down. It would also be helpful if people were not so selfish and would actually wait in lines and respect the traffic laws (red lights, lane racing to move one car length ahead, etc) A lot of the issues with bad driving are lack people caring about anyone but themselves. This is why my kids are car riders. Stupid people don’t watch out for buses!! In fact, even talking to someone else in the car is distracting, uses up brain power and increases the chance you will make a mistake resulting in a collision. I agree with Mark. No cell phones. No radios. No passengers. No printed materials. No daydreaming in cars. Or maybe it is just this particular driver. Whatever. Rabble rabble. Glad the kiddos are okay. The car that went under the bus was stopped, when the red one hit it. There was a soft drink and biscuit pieces all in the red car, so the driver must have been eating breakfast from McDonalds. I passed this accident on the way to work today and was horrified. Can we say “Texting”? Sorry @Mary, but even TALKING on the phone is JUST as bad as texting. Don’t try to say one is safer than the other. Both take your attention away from the road. I always love those people that claim “I am a great multi-tasker”. Well maybe so, but when you are “multi-tasking”, it is IMPOSSIBLE to put 100% of your attention into one thing, and when you are DRIVING, then THAT should be the thing you have 100% of your attention focused on!! That text message or phone call can wait until you are PARKED! I just want to say Thank you to the Beulah Staff for being a caring for the children. Mrs.Lewis you really are a wonderful person thank you for caring for our children with such a open heart. I agree w/Mark….what the heck is so important that you have to use a phone while driving??? talking is 1 thing but the 1s that TEXT are stupid! very lucky people, few years ago a auto went under a buss like that and the driver of the auto almost died. 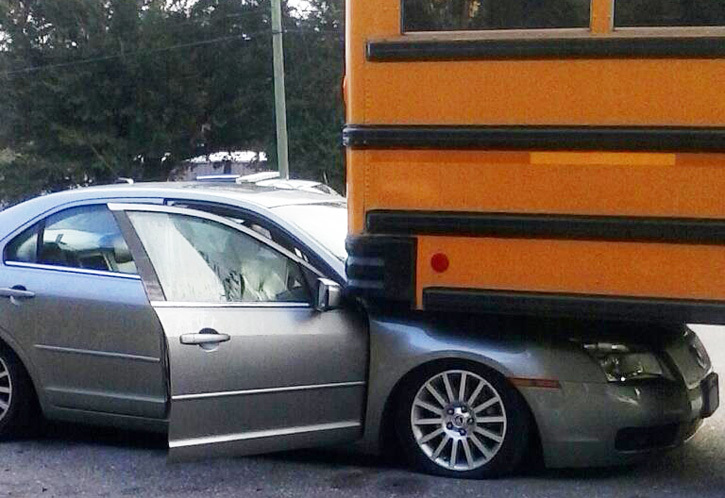 The driver was badly hurt when the rear end of the bus impacted the drivers head. the driver lived but suffers complete brain damage. so glad no students were hurt and the diver at no fault to his own was also okay it could have been much worse out come. WOW! Just had a co-worker that was stuck in the traffic there show me a picture of the wreck! Thank God, none of those children were hurt!! What was that idiot thinking?? Why don’t people pay attention when there is a GREAT BIG BRIGHT YELLOW school bus with FLASHING LIGHTS?!?!?! Odds are, they were “distracted driving”. Bet if Johnny Law checked their phone, they were on a call or texting before the accident.